Javier Vivo with his health benefits card he received through work at Miami International Airport. 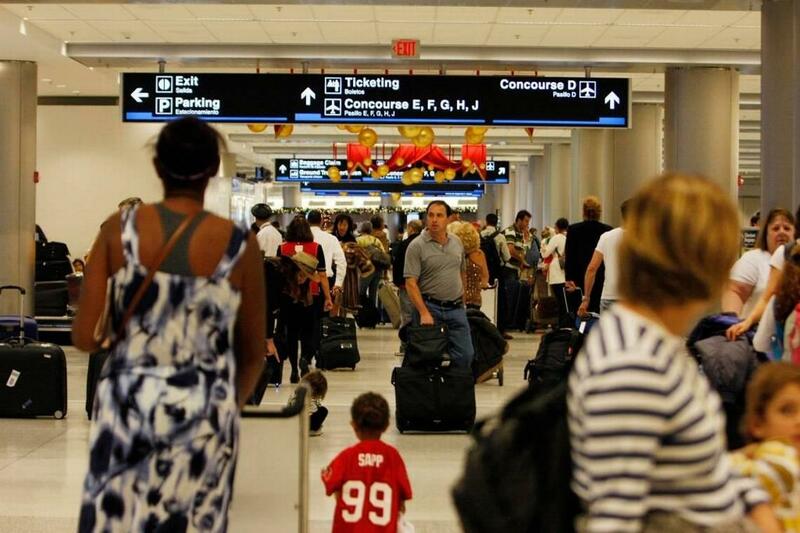 Javier Vivo helps carry passengers’ bags and pushes wheelchairs at Miami International airport’s J Terminal, welcoming international travelers to the area. When he was hired as a part time employee, he wasn’t given a choice whether to take his company’s health insurance or not. It was take it or leave the job. When Vivo tried to use his insurance at the emergency room to take care of a stomach issue, though, he found out the insurance card did not give him access to much of an insurance plan. Now he and other airport workers are claiming that their health insurance is below the standard required by county law. They’re demanding back pay and restitution and their challenge is proving to be a new test for Miami-Dade County’s 1999 living wage ordinance. The county's living wage notice. Because it is a subcontractor at the Miami International Airport, Ultra is bound by the county’s living wage ordinance. That requires county workers or contractors to be paid at least $15.52 an hour, unless an employer offers health insurance. Then, the minimum pay drops to $12.63 cents an hour. The $2.89 difference goes to pay for the employee’s health insurance. When Vivo got sick and went to the emergency room he was in and out for a few hours. “Fifteen days later, I received the first letter, that I had to pay $1,429 only for the physician payment,” he explained. A few days later he got a full bill for more than $4,000. Insurance took nothing off. He’s especially frustrated because he canceled his Obamacare plan he liked because he got insurance through Ultra. Kathy Bakich is a healthcare compliance consultant hired by the service workers union 32BJ SEIU to review the part-time worker plan offered to employees like Vivo. She says Vivo’s plan isn’t exactly a health insurance plan like Aetna or United. Javier Vivo's health plan through Ultra Aviation Services. “[Those are] traditional health plan[s] where you get a card and it says you have insurance and you take it to your doctor and you might have a co-pay or deductible or a co-insurance where you're paying a percentage the percentage of the bill. None of that applies here,” says Bakich. Part-time workers for Ultra Aviation — roughly 300 people like Vivo — are all under a cash indemnity plan. It provides cash back for various kinds of services. For Vivo’s $4,000 visit to the hospital, he’s supposed to get $200 cash to help pay for the cost of the visit. His plans outline other benefits: $30 for a doctor’s visit, $400 for inpatient surgery. From the front of the health plan given to part-time workers with Ultra Aviation Services. “[Indemnity plans are] not related to what your illnesses are, what the doctors charge or anything like that,” said Bakage. Helene O’Brien is director of 32BJ SEIU, which has been helping the airport workers bring their complaints to the county. She says Ultra’s plan is in violation of the living wage ordinance. “The workers believe this and it's led us to believe, as we've looked deeper, that it's a reason that Ultra does it, is so they pay people $12.63, not $15.52,” said O’Brien. Whether a health plan qualifies under the living wage ordinance is not defined by county law. Section 2-8.9, the county law, points to a state statute that doesn’t exist any more. 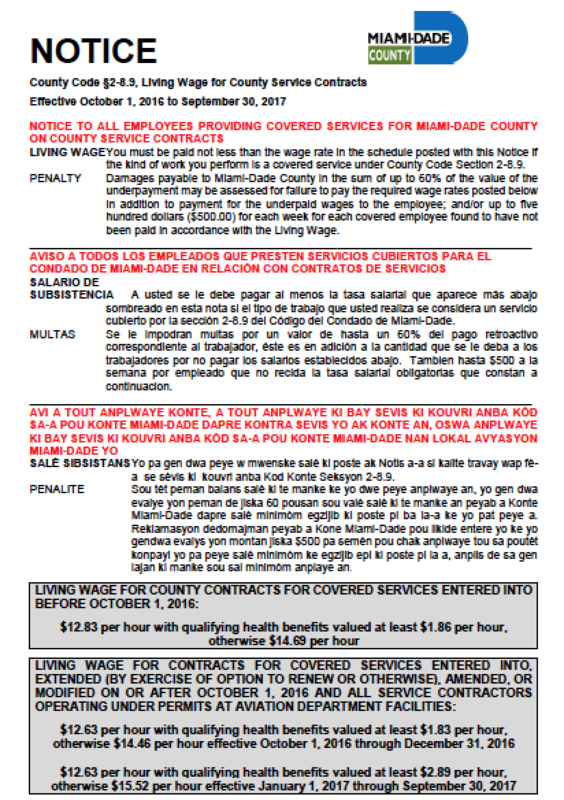 Workers for a contractor at Miami International Airport say their health insurance fails to meet the county's Living Wage Ordinance standards. Essentially, he says, there’s no way they can be violating something that doesn’t exist. At a County Commission meeting, De Grandy stood by the company’s health plan. “My client is in full compliance with the living wage provisions of your ordinance. In fact, my client was audited two times last year based on complaints filed by the union. Two times it was found to be in full compliance with the living wage ordinance,” said De Grandy. O'Brien said she doesn’t buy it. A manager with the county’s Internal Services Department wrote in an email to a union researcher that the county had recently reviewed the issue. Even though the current ordinance leads to a nonexistent state statute, there are still standards and those are part of the Affordable Care Act, the email said before outlining the standards. Standards that the union says the Ultra plan does not meet. O’Brien says Ultra should be penalized for that. “The county has the power to terminate Ultra's permit for not being in compliance with the living wage ordinance. And it also has the power to require Ultra pay the difference that it didn't pay to those 300-plus workers over the past couple of years,” said O’Brien. Before the county can talk about penalty, though, it has to figure out if Ultra’s health plan is in violation in the first place, uncharted territory for the county. “Never before has there been an argument regarding the health benefit plan side of it,” said Milton Collins, associate director of Minority Affairs at the airport. Collins is in charge of enforcing the living wage ordinance at MIA, and says the typical case is of simple underpayment. “The argument has always been, ‘You're paying these employees $11 an hour, where the wage rate is $12.63 an hour,” he said. Wading through the intricacies of a health plan though, Collins says, is not something his office is really set up to do. “We are not experts in the area of insurance. When we get the documentation from the companies attesting that the insurance that they have meets the qualifications, we go by that attestation,” said Collins. A collections letter Vivo received for part of his hospital bill. He says his office and the county are going to move slowly to try and figure this all out, as it will set the precedent for the rest of the county. Meanwhile, Javier Vivo has received calls from the hospital and a collections letter for his hospital bill. He says he can’t pay it. Vivo was so frustrated by the health plan he gets through Ultra, he’s now paying to get an Obamacare plan again, essentially paying for two plans at once. He’s filed a complaint with the county hoping for back pay and for the company to pay for his medical bills. He says the back pay wouldn't cover it all.